Established in 1909, Fort Kamehameha played an important role within a system of coastal defenses of the Army Coast Artillery Corps that served as a key component of the national defense of the United States in the early 20th century. In a public address on June 11, 1911, Brig. Gen. M. M. Macomb (Commander, District of Hawai‘i) stated that Oʻahu would be encircled with a ring of steel, with mortar batteries at Diamond Head, big guns at Waikīkī and Pearl Harbor, and a series of emplacements from Koko Head around the island to Waianae. Between 1911 and 1914 the Army Corps of Engineers built four batteries at Fort Kamehameha (Selfridge, Hasbrouck, Hawkins, and Jackson), adding a fifth one (Battery Closson) in 1920. These batteries were key sections of Oahu’s “ring of steel,” which included Forts Armstrong, DeRussy and Ruger, along with Ford Island Military Reservation. The Army fortified O‘ahu’s harbors with a system of gun emplacements employing mortars and long-range rifled guns. Although its guns are gone, the old batteries are still there. Battery Selfridge was 500′ x 90′, the largest of the batteries. With an earth berm concealing the makai side, the massive two-story concrete structure was built to support eight 12-inch mortars (four to a pit). The 12-inch guns could send a 1,046-lb. projectile approximately 17,000 yards. Battery Hasbrouck was a one-story concrete structure with a total area of 470′ x 100′. Battery Hasbrouck supported eight 12-inch mortars placed in quads of four per pit; each could send a projectile approximately 15,200 yards. Battery Hawkins was located along the water at the south-eastern edge of the Fort Kamehameha. It supported two 3-inch rapid-fire rifled cannon-mounted pedestals. Each gun had a range of 11,100 yards when firing a 15-pound projectile. These guns were meant to cover the entrance to Pearl Harbor, where submarine mines would be activated in time of war. Battery Jackson is the smallest of these coastal batteries. This single-story concrete structure includes three magazine sections, with a total area of 73′ x 86′. It supported two 6-inch rifles mounted on disappearing carriages. These breech-loaded cannon could send a 106-lb. projectile a maximum of 14,600 yards. Battery Closson supported two 12-inch rifles mounted on barbette carriages with a 360-degree field of fire. These guns could cover all but the northern-most Oahu beaches. These guns could be fired at elevation angles up to 35 degrees, and the range of the 12-inch guns was increased to 30,100 yards (17.1 miles) firing a 975-lb. projectile. OK, that’s the armament part of the story, but there’s more to this than early-1900s military defenses. The land, once the site of Queen Emma’s home, contained three shallow fishponds, groves of trees and a marsh when the Army purchased it in 1907 and built the first gun battery. Today, the area has been recognized as an historic area. In addition to the armaments, Fort Kamehameha historic area encompasses a flagpole, chapel and 33 homes built in 1916. The bungalow style homes are in two styles, four in a large H-shaped plan and 29 in a smaller U-shaped footprint. When you land at Honolulu International Airport, you almost always fly over Fort Kamehameha and these homes. They are an intact residential complex with a neighborhood feel of mature trees, large expanses of grass and open space, access to the waterfront, and a children’s playground. A proposal to dispose of Fort Kamehameha is the result of a regulation that limits the uses that can occur along the flight path of runways at nearby Honolulu International Airport, which shares the runways with the Air Force and Hawai‘i Air National Guard. In 2008, Historic Hawai‘i Foundation put Fort Kamehameha on its Most Endangered Historic Sites in Hawai‘i list. I concur with their assessment. The homes were there first, before any airfield in the area. We need to remember, the homes were built in 1916; Luke Field on Ford Island started in 1919; Honolulu International Airport (HNL) opened in March 1927 as John Rodgers Airport and Hickam Field started in 1934. John Rodgers, Commanding Officer of the Naval Air Station at Pearl Harbor from 1923 to 1925, left to command the Navy’s historical flight between the West Coast and Hawaiʻi. On August 31, 1925, Rodgers and his crew left San Francisco to attempt the first flight across the Pacific Ocean from the Mainland US to Hawaiʻi. The seaplane was forced to land in the ocean after running out of fuel, about 365 miles from Oʻahu. After three days of waiting to be picked up, the crew crafted sails from the wings of the plane and sailed toward Hawaiʻi. On the tenth day, they spotted Kauaʻi. Ten miles off shore they met a submarine which towed them safely to shore. In response to the growing demand to accommodate aviation presence, the Territorial Legislature appropriated funds for the acquisition and improvement of an airport and/or landing field on the Island of Oʻahu, within a reasonable distance of Honolulu. According to the Act, Territorial Treasury funds needed to be matched with private funding; the Chamber of Commerce raised the matching money from local businessmen. From these funds, about 119-acres of fast (dry) land and 766-acres of submerged land were purchased from the SM Damon Estate as an airport site. John Rodgers Airport (named in honor of Rodgers) was dedicated March 21, 1927 and placed under the jurisdiction of the Territorial Aeronautical Commission – then, construction began. In 1929, a runway 250-300 feet wide and 2,050-feet long was completed as well as considerable clearing on the balance of the area. Over the next few years, the facility faced various stages of expansion, on land and in the water – the layout included a combined airport and Seadrome, with seaplane runways in Keʻehi Lagoon adjacent to John Rodgers Airport. Following the attack on Pearl Harbor on December 7, 1941, all airports were taken over by the US armed forces. The Army Corps of Engineers began to build four runways at John Rodgers Airport which would become Naval Air Station Honolulu (NAS 29) and home base for an Army and Navy Air Transport Command. 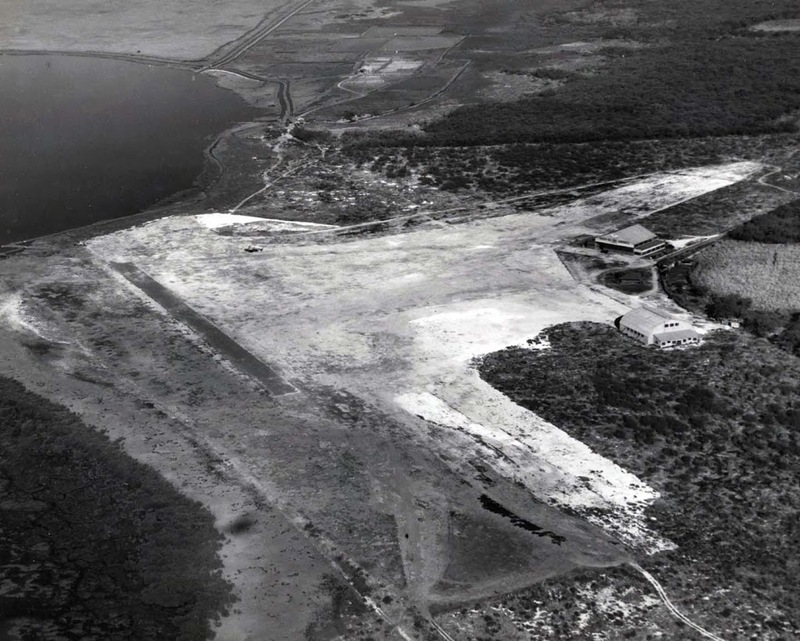 Dredged material from the seaplane runway was used to fill some of the submerged land and raise the elevation of the airport to about eight feet. The land area was increased from about 200-acres to more than 1,000-acres. Over the years, the facilities expanded. The Navy completed construction of a terminal building, control tower and maintenance hangars for land planes operated by the Naval Air Transport Services. On the north side of the field, the Navy built the Naval Air Station Honolulu to support the Naval Air Transport operations and to house about 5,000-men. The airport was officially designated as Naval Air Station Honolulu, with the primary mission of maintaining and operating a base for Naval Air Transport Units, Pacific Wing. During the war years, John Rodgers Airport was also home base for the Naval Utility Flight Unit, Naval Air Transport Service, 1522d AAF Base Unit, 15th Air Service Squadron and 19th Troop Carrier Squadron. In 1946, John Rodgers Airport was one of the largest airports in the US and comprised over 4,000-acres. It had four paved land plane runways, 200 feet wide and with lengths varying from 6,200 linear feet to 7,650 linear feet. There were three seaplane runways, each 1,000 feet wide with an average length of approximately 2.7 miles. Space for federal agencies was provided, including the CAA Control Tower, Airways Traffic Control and Communication Center. Also US Customs, US Immigration, US Department of Agriculture, US Public Health and US Weather Bureau. John Rodgers Airport was returned to the Territory on October 1, 1946; the following year the name changed from John Rodgers Airport and Keʻehi Lagoon Seaplane Harbor to Honolulu Airport. In 1951, its name changed to Honolulu International Airport. Recognizing the importance of making visitors welcome in Hawaiʻi, Lei Stands replaced cars and trucks, that previously had parked on the airport entry road. Then, in 1953, Honolulu International Airport’s combine Hickam/Honolulu 13,097-foot runway was officially declared the longest runway in the world by the Airport Operators Council. By 1959, most major airlines serving Hawaiʻi decided to purchase jet aircraft and have them in operation between Hawaiʻi and the mainland; the next expansion of the airport was timed to the schedules of the major airlines. On February 5, 1959, a groundbreaking ceremony was held to mark construction to accommodate “jet age facility (that was) the first of our major public improvements when Hawaiʻi becomes a state” and “a facility which Hawaiʻi will be proud of.” (Governor William F Quinn) The first jet service from the mainland US and Hawaiʻi started later that year. In 1962, Hawaiʻi Visitors Information Program was established to welcome passengers at Honolulu International Airport and Honolulu Harbor, to encourage travel to the Neighbor Islands, and to provide information and other help to airport and harbor visitors. A Joint Use Agreement between Hickam AFB and Honolulu International Airport was signed in 1963. It specified that for the purpose of overall aerial and ground operation, Hickam AFB and HNL comprised a single airport complex. Construction of the first phase of the long-awaited Reef Runway over the fringe reef began in 1972; the runway was completed and dedicated for use on October 14, 1977. HNL (identifying Honolulu International Airport) is part of the 3-letter airport and 2-letter airline codes administered by the Montreal-based International Air Transport Association (IATA.) It was patterned after the National Weather Service 2-letter identification system, giving a seemingly endless 17,576-different combinations. The image shows John Rodgers Airport, Honolulu, 1928. In addition, I have added other related images in a folder of like name in the Photos section on my Facebook and Google+ pages. Bud Mars was the first man to fly an airplane in Hawaiʻi, on December 31, 1910. Piloting a Curtiss B-18 biplane, he flew to 500-feet over Moanalua Polo Field, Oʻahu. He repeated the flight the next day to the thrill of thousands of spectators. The first aircraft accident in the Islands was on the Big Island, dating back to June 10, 1911 when Clarence H Walker came to Hilo for an exhibition flight in his Curtiss Biplane. There were no airports on the island, so Hoʻolulu Park was selected for the runway. Walker was able to get a few feet off the ground in his trial flight. Later Walker attempted to fly over the city. The engine began missing and he lost altitude. He crashed minutes later into a lauhala tree as he attempted to land, destroying the plane but surviving the crash. On August 31, 1925, John Rodgers (Commanding Officer of the Naval Air Station at Pearl Harbor from 1923 to 1925) and his crew left San Francisco to attempt the first flight across the Pacific Ocean from the Mainland US to Hawaiʻi. The seaplane was forced to land in the ocean after running out of fuel, about 365 miles from Oʻahu. Lieutenant Lester J Maitland (pilot) and Lieutenant Albert F Hegenberger (navigator) were selected to fulfill the Army’s dreams to successfully cross the Pacific Ocean to Hawai‘i. Shortly after 7 am on June 28, 1927, the Army pair shook hands with their crews and climbed into positions in the airplane. 25-hours and 49-minutes later the three-engine plane touched down at Wheeler. That year, Hawaiʻi’s first airport was established in Honolulu and dedicated to Rodgers. When Inter-Island Airways (now Hawaiian Air) began the first commercial passenger flights between islands in 1929, their hangar was one of two on the airport. All civilian aircraft in Hawaiʻi were grounded. Within a few days, Hawaiian Air was approved by the Military Governor to make emergency flights under military direction, carrying engineers, medicines, munitions, etc to the neighbor islands. During the early days of the War, Hawaiian’s Sikorsky planes were converted to cargo planes, carrying critical medical supplies and equipment to the other islands and bringing back cargo of fresh vegetables and beef. Thus began the first US air-freight service. The military began to construct airfields for its own use, for seaplane and land plane operations, across the Islands. Following the war, many of these facilities were returned/turned over to the Territory for commercial and general aviation. On December 13, 1955 Honolulu International Airport became the first civilian airport in the nation to get a preview of commercial jet aircraft operation when the British DeHavilland Comet III jet-liner arrived on a good will flight around the world. 1959 brought another welcomed change. Scheduled service with the Boeing 707 started in June 1959 by Qantas Airlines; flying time from California to Hawaiʻi was cut by nearly a half, from 9 hours by propeller to less than 5 hours by jet. Pan American Airways followed in September and United Airlines jet service arrived at Honolulu in January 1962. In October 1962, all airline operations moved from the Honolulu terminal building built by the Navy during World War II on Lagoon Drive to new passenger terminal buildings on the North Ramp of the airport. Planning for the Reef Runway at Honolulu International Airport began in 1967; its primary purpose was to mitigate noise during aircraft takeoffs. The image shows John Rodgers Airport (now Honolulu International Airport) in 1928 (hawaii-gov.). In addition, I have added related images in a folder of like name in the Photos section on my Facebook and Google+ pages. When whaling was strong in the Pacific (starting in 1819 and running to 1859,) Hawaiʻi’s central location between America and Japan whaling grounds brought many whaling ships to the Islands. Whalers needed food and the islands supplied this need from its fertile lands. As trade and commerce expanded across the Pacific, numerous countries were looking for faster passage and many looked to Nicaragua and Panama in Central America for possible dredging of a canal as a shorter, safer passage between the two Oceans. Finally, in 1881, France started construction of a canal through the Panama isthmus. By 1899, after thousands of deaths (primarily due to yellow fever) and millions of dollars, they abandoned the project and sold their interest to the United States. After Panamanian independence from Colombia in 1903, the US restarted construction of the canal in 1905. Finally, the first complete Panama Canal passage by a self-propelled, oceangoing vessel took place on January 7, 1914. The Panama Canal is a 51-mile ship canal in Panama that connects the Atlantic Ocean (via the Caribbean Sea) to the Pacific Ocean. The canal cuts across the Isthmus of Panama and is a key conduit for international maritime trade. The American Society of Civil Engineers named the Panama Canal one of the seven wonders of the modern world. The first cargo ship passing westward through the Panama Canal to call at Honolulu was the American Hawaiian Steamship Company’s SS Missourian commanded by Captain Wm. Lyons, on September 16, 1914. By 2008, more than 815,000 vessels had passed through the canal, many of them much larger than the original planners could have envisioned; the largest ships that can transit the canal today are called Panamax. OK, so what does this have to do with Hawaiʻi? In 1900, Alfred Thayer Mahan, a US Navy flag officer, geostrategist and historian (called “the most important American strategist of the nineteenth century,”) believed that the American line of communications to the Orient was by way of Nicaragua and Panama, as that of Europe was by the Suez. Mahan saw that the Caribbean, areas surrounding the future canal, Hawaiʻi and the Philippines composed the strategic outposts for the future isthmian canal. 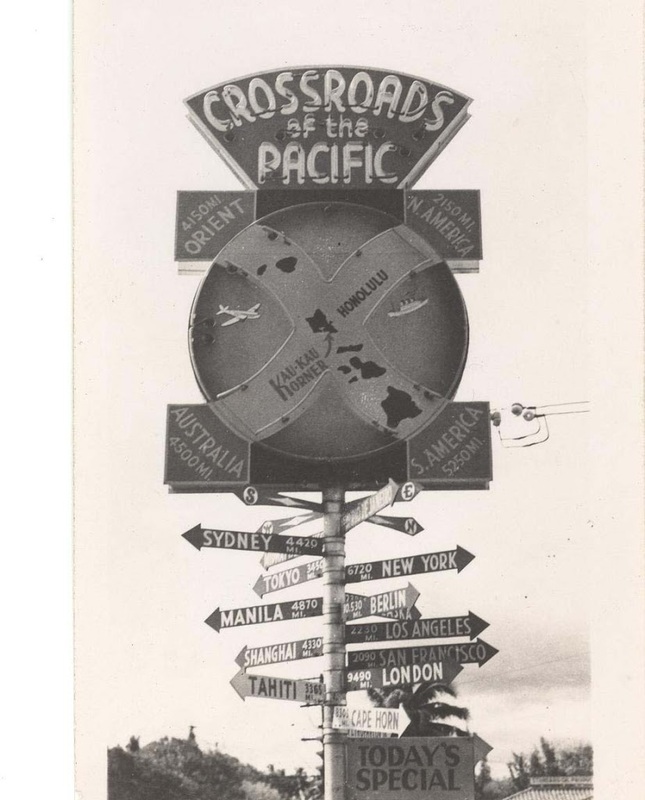 In 1912, this strategy and declaration was claimed in an article in ‘Paradise of the Pacific’ that Hawaiʻi was truly deserving of the name, “Crossroads of the Pacific”. Testimony in Washington, DC, in 1915, noted that the opening of the canal would affect Hawaiʻi in two ways: traffic to and from the Orient would use Hawaiʻi as a way-station for supplies and instructions; and Hawaiʻi would also be a destination for freight, passengers and tourists. Later, when Navy Commander John Rodgers and his crew arrived in Hawaiʻi on September 10, 1925 on the first trans-Pacific air flight, they fueled the imaginations of Honolulu businessmen and government officials who dreamed of making Hawaiʻi the economic Crossroads of the Pacific, and saw commercial aviation as another road to that goal. Two years later on March 21, 1927, Hawaii’s first airport was established in Honolulu and dedicated to Rodgers. The image shows the former Kau Kau Corner restaurant Crossroads sign. In addition, I have included other images in a folder of like name in the Photos section on my Facebook and Google+ pages.